October was a rough ride for global stock markets as they were slammed by a wave of fears about trade wars and higher interest rate. Amidst the chaos, there is always buying opportunities in a sell-off. I have initiated a small position in Far East Hospitality Trust at $0.595 in Oct. At this entry price, it is trading at 31.27% discount to its NAV/unit of $0.8657. Based on the 2017 DPU of 3.90 cents, this translates to a distribution yield of 6.55%. Listed on SGX since Aug 2012, Far East Hospitality Trust ("FEHT") is a Singapore-focused hotel and service residence hospitality trust. Its portfolio of 13 properties consists of 9 hotels and 4 serviced apartments. With the exception of Village Residence Hougang and Village Hotel Changi, the remaining hotels and residences are located within the central district of Singapore. The latest addition to the portfolio is Oasia Hotel Downtown which was acquired from the sponsor on 2 April 2018. The acquisition was 88.96% funded by debt, 10.31% by DRP proceeds and 0.73% by equity. FEHT earns its gross revenue from 3 different categories, with the majority derived from the hotel segment (70.2%), followed by commercial (18.2%) and serviced residences (11.6%). Other than hospitality, FEHT has a total of 286 units of retail, office and serviced office commercial space housed in 9 of the properties. If we were to break down the gross revenue by assets, the Orchard Rendezvous Hotel appears to be the prized property, accounting for 19.56% of the gross revenue in 2017. If we were to look back at the track record of FEHT, it is anything but stellar. The NPI has been on a declining trend since 2013 which has mainly been attributed to heightened competition from an oversupplied hospitality market. 2018 has seen gradual recovery with the NPI for 2018 YTD at 9.1% higher than that of 9M 2017. The contribution from the newly acquired Oasia Hotel Downtown has also helped to provide a boost to its 2018 report card. The DPU history for FEHT has also presented similar downtrend over the years. Likewise, there is sign of improvement this year with the DPU for 2018 YTD at 2.4% higher than that of 9M 2017. It is not a significant upswing but at least the slump did not persist. Based on the 3Q 2018 Financial Results, I am sanguine about FEHT performing better this year. The performance of hotels in FEHT portfolio has been promising, with an increment in the occupancy, ADR and an improvement of 5.8% in RevPAR over 2017 YTD. On the contrary, the performance of serviced residences in FEHT portfolio has been disheartening, with a 1.2% slide in RevPAR over 2017 YTD. As of 30 Sept 2018, FEHT has a gearing ratio of 40.4%. 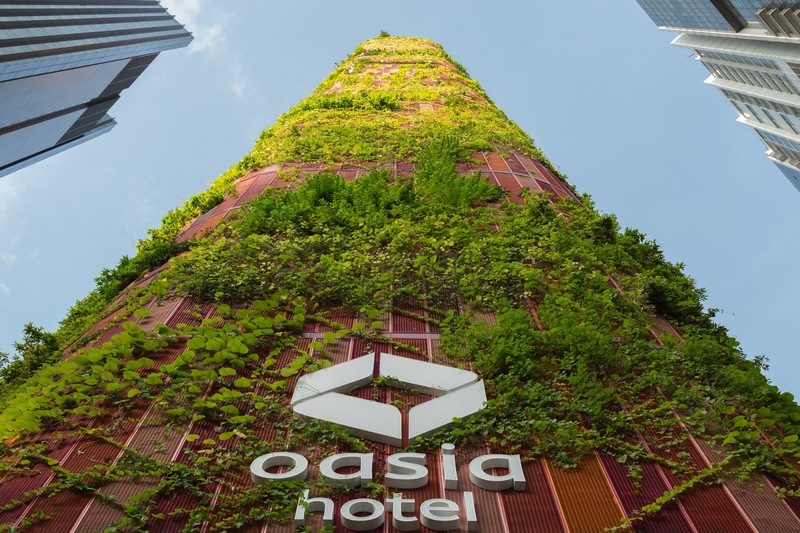 The recent 5% increment in gearing ratio in 2Q 2018 is partly due to debt financing (88.96%) of the acquisition of Oasia Hotel Downtown. Benchmarking against the 45% leverage limit set by MAS for REITs, this restricts the financial flexibility of FEHT and its debt headroom for any future acquisition. In the near term, $100m term loan has been secured and the debt maturity will be extended to 2022 and 2025. This brings the weighted average debt maturity to 3.1 years. 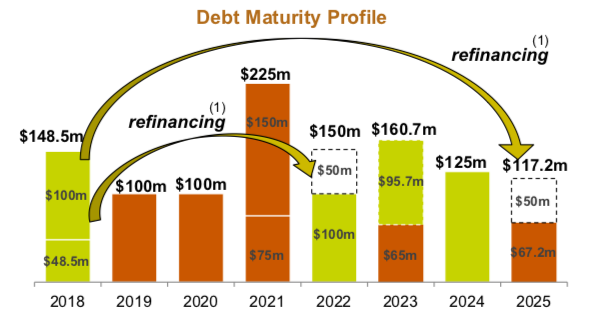 From the debt maturity profile, the outstanding debt of FEHT is mostly evenly spread out over the next 7 years, with the bulk of it (21.92%) due in 2021. 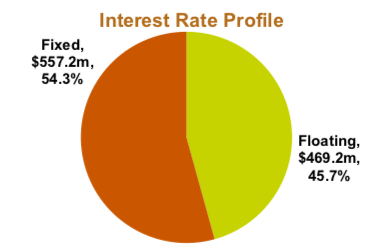 The interest rate exposure on its borrowing is 54.3% hedged by derivative financial instruments such as interest rate swap contracts. Personally, I feel that the proportionately low fixed rate hedging component can be a cause for concern, especially in a rising interest rate environment. Based on the historical data since 2012, the average share price of FEHT is at $0.764 as represented by the blue line in the chart. Since the mid of 2015, the share price of FEHT has remained bounded within one standard deviation below the mean. According to the chart, the entry price of $0.595 is beyond one standard deviation and 22.12% below the mean. When set side by side with its hospitality / serviced residence peers, FEHT offers the greatest discount to its NAV/unit at 0.69. Even though the average cost of debt for FEHT is only 0.23% higher than the average of the hospitality REITs, every 0.1% increment in the cost of debt would make a significant difference, especially with FEHT's high gearing ratio, coupled with low proportion of hedging. This may put FEHT at a disadvantage. I would consider OUE Hospitality Trust to be the closest hospitality peer to FEHT primarily due to their Singapore-focused hotel sites. Despite its higher than average gearing ratio, OUE H Trust has 71% of its debt fixed via interest rate swaps and able to secure a lower cost of debt. Comparatively, it offers a lower margin to its NAV/unit as compared to that of FEHT. Orchard Rendezvous Hotel has recently completed its refurbishment and rebranding in Sept 2018, joining the Rendezvous brand in Singapore. Located at the end of the glitzy shopping district of Orchard Road, I am optimistic that the newly refurbished hotel would provide a positive boost to FEHT's performance. The landmark summit between US President Donald Trump and North Korean leader Kim Jong-un in June, Bloomberg New Economy Forum in November and the showcasing of the Republic as the outlandishly opulent setting of Hollywood hit film, Crazy Rich Asians (mahjong scene, anyone?) in August, are some of the high-profile events this year that put the little red dot into the global spotlight. Just this week, Singapore has hosted the 33rd Asean summit which brought together leaders of the 10 Asean countries, along with heavyweight guests including Russian President Vladimir Putin, Chinese Premier Li Keqiang, Prime Minister of Canada Justin Trudeau and United States Vice-President Mike Pence. I am positive that the rich vein of PR opportunities for Singapore will help to boost the tourism and hospitality sector in this city state. In 2014, FEHT took a 30% stake in a joint venture with its sponsor, Far East Organization for hotel development on Sentosa. The project comprises of three hotels - Village Hotel, The Outpost Hotel and The Barracks Hotel. The Outpost Hotel and Village Hotel are set to open in April 2019 and will target the mid-tier segment which is underserved in Sentosa. The Barracks Hotel will open in August 2019 and will be highly exclusive with only 40 rooms available. Furthermore, there are plans to redevelop Pulau Brani and Sentosa and integrate with the Greater Southern Waterfront project, utilising the space after the Tanjong Pagar container ports have relocated. With the focus of Sentosa as a tourist attraction, I believe the hotels in Sentosa are well-positioned to benefit from it in the coming decade. The pipeline supply of new hotel rooms has tapered off in 2018 due to the lack of new hotel sites introduced in the Government Land Sales programme for 5 years. Two sites in Marina View and Club Street have been released in June 2018 amid a rosier tourism outlook for Singapore in the next few years. With the tightening of approval for new development applications by URA for hotel, boarding houses and backpackers's hostel uses in 2014, I am assured that the controlled supply of hotels will benefit FEHT in the long run. 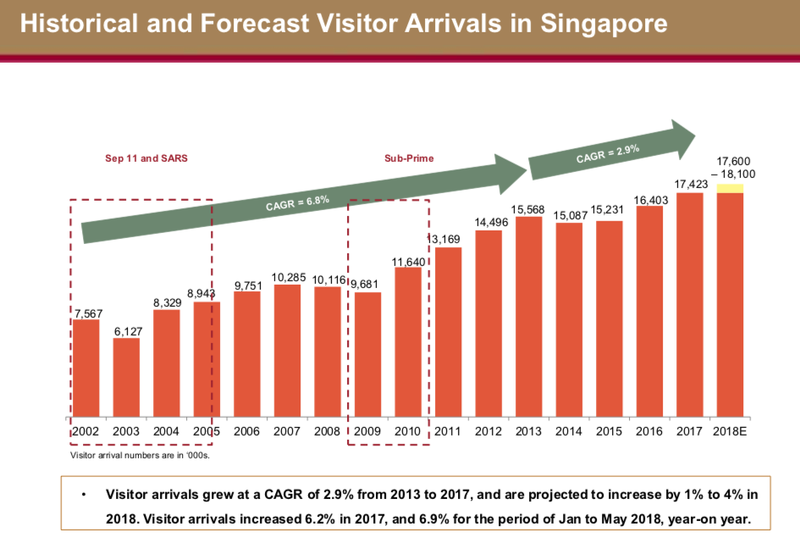 Based on the statistics from Singapore Tourism Board, the number of visitors to Singapore has been on the rise over the years. Visitor arrivals in Singapore has increased 7.7% year-on-year in the first half of 2018. Based on the information from STB, the top 5 markets for tourist arrivals in 2017 are China, Indonesia, India, Malaysia and Australia. 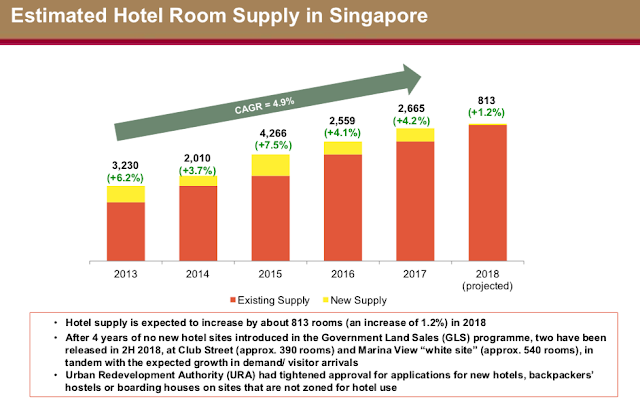 The recovery of the hospitality sector in Singapore is likely to be underpinned by growing demand for accommodation from continued strong tourist arrivals and controlled supply of hotel rooms. In Aug 2018, Village Hotel Changi and Village Hotel Katong (under Orchard Mall) and 2 other hotels were suspected for possible infringement of Competition Act by exchanging commercially sensitive information on non-public room rate they offer to companies. Imposition of fines is likely to be inevitable if found guilty. As FEHT owns hospitality properties in Singapore only, it faces certain degree of geographical and concentration risk to rely on a niche market in a single country. Adverse media relating to Singapore as a travel destination (e.g. outbreak of disease) would definitely impact the tourism sector unfavourably. During the recent public consultation, URA has proposed using private houses as short-term accommodation with an annual cap of 90 days per year. Though the consultation was concluded with "mixed views", Airbnb has been actively involved in committing to reasonable solutions for the thriving of home sharing in Singapore. This comes especially after the recent controversy surrounding the 2 Singaporean Airbnb hosts who were fined in April 2018 for unauthorised short-term letting their condominium units. As of now, the minimum rental periods for private homes and public housing in Singapore are 3 and 6 consecutive months respectively. As such, the current rental market would cater to a separate demography of Airbnb's guests from hotel patrons, who seek to stay in Singapore for mid to longer period. Though short-term accommodation in private and public homes is currently not legal in Singapore, I think the implementation of a regulatory framework for short-term letting is imaginable in the future. At my entry price of $0.595, it would be a 31.27% margin of safety to its NAV/unit. The combination of controlled hotel supply and strong tourist arrivals should bode well for the local hospitality industry. Additionally, the hotel development in Sentosa remains an exciting prospect for the following year. When things go south and FEHT has to liquidate its assets, I suppose there is a considerable margin for me to fall back on. Disclaimer: All information in this post is published in good faith and for general information purpose only. The ideas and opinions expressed in this post are purely that of the author's and should not be used or construed as an offer to sell, a solicitation of an offer to buy, a recommendation for any security or as professional financial investment advice. This is a very solid review of the company. I have this too and am looking at that discount to nav and a rebound in the tourism sector to push up the price but looks like it'll be quiet for a while. The revpar for the sg hotels have not really picked up in last quarter, I guess have to further give it a monitor. Yes, it is the steep discount to NAV and the recovery in the local hospitality industry that attracts me at first. 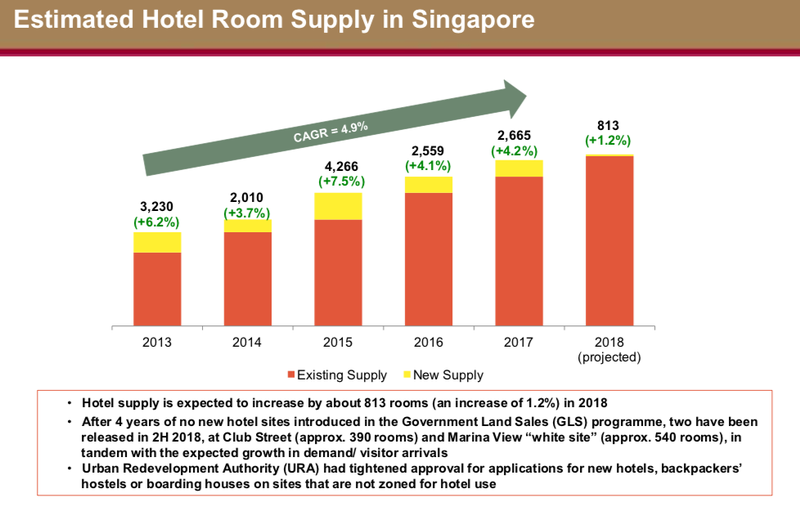 Hopefully the controlled hotel supply and strong tourist arrivals will provide a boost to the revpar of sg hotels in the next few years to come. nice article. Points well laid out and easy to understand.